The Boyne-Valley Complex. (Newgrange, Knowth and Dowth). The Newgrange 'Light-Box' - What was it for? The M3 Desecration of the Tara landscape. There are around 300 passage mounds in Ireland. There are thought to be between 30,000 and 40,000 tumuli and cairns in Britain and Ireland alone. The range of dates from the Carrowmore complex (5,400 BC-Tomb 4 to 3,100 BC-Tomb 56) (1), demonstrates that Ireland was home to an uninterrupted tradition of megalithic construction for over 2,000 years. Perhaps it was the relative geographical isolation of the island, the nature of the landscape or some other factor, but whatever the reason, Ireland offered the Neolithic builders the opportunity to express an aspect of themselves in a way which is often not clearly understood today, namely the development of the relationship between people, their constructions, the landscape and ultimately, the universe itself. 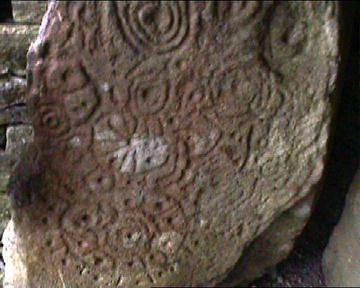 This primitive form of communication is seen through the placement and design of the Irish megaliths, several of the most significant of which are located in such a way as to be inter-visible with each other, simultaneously incorporating significant solar or lunar orientations in their design and complimented by engraved symbols that tease us with their simplicity. The Irish megaliths offer some of the best examples of megalithic art in Europe. The significant association with 'solar-wheels', spirals, lozenges etc, at locations with an astronomical significance suggests an relationship, but one which is not yet clearly understood. The Boyne-Valley complex: (Newgrange, Knowth and Dowth). Set on a curve of the River Boyne, this megalithic complex is perhaps the best known of all Irish sites. The three main passage mounds and their satellites are orientated and aligned, so as to indicate the arrival of significant days in the solar and lunar cycles. The structures in the Boyne valley act together like a huge observatory which would have enabled the builders to have accurately calculate and predict the motions of the sun, moon and earth, in a similar way as at other complexes such as Stonehenge, Carnac or the Orkneys. 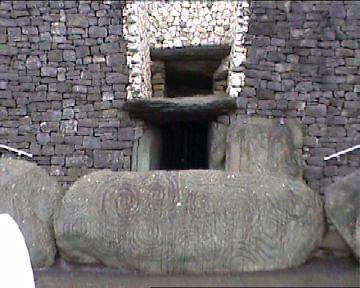 The Light-box (Left) at Newgrange is one of the most satisfying relics from the Neolithic times as it reveals the builders of the passage mounds as a highly skilled and organised workforce at the same time as identifying in them a quality of intellect, calculation and having the mechanics to accurately record the solar and lunar cycles. Similar discoveries from the Orkneys, France and other Neolithic locations demonstrates that accurately recording the solar and lunar cycles was an extremely important part of the cultural identity of our European Neolithic ancestors, but with at least two recorded Light-boxes and talk of more, the Irish light-boxes take the trophy for excellence. This site is regarded as the 'spiritual' centre of Ireland, in a similar way as Glastonbury is to England. On the top of the hill is the 'mound of hostages' upon which stands the 'Stone of Destiny', the very navel of Ireland. The prehistoric and sacred landscape of the Tara Valley has been recently desecrated by the building of a Toll-motorway through the valley. (Destroying over 40 prehistoric sites in the process, including the Lismullen Henge). A collection of over 30 passage mounds containing carved lintels, Kerb-stones, spirals and solar 'wheels'. This site is now recognised to have several significant astronomical orientations, placing it alongside its Boyne valley neighbours in importance. The inter-visibility of these two great sites offers an insight into the way the megaliths and the landscape were used together as a means of communicating our existence through symbolic design. The idyllic atmosphere of this beautiful little Henge-circle is complimented with some excellent examples of prehistoric masonry techniques, similar to those found in France, Portugal, Egypt and around the ancient world. Castleruddery is also home to two 50-ton quartz portal-stones. 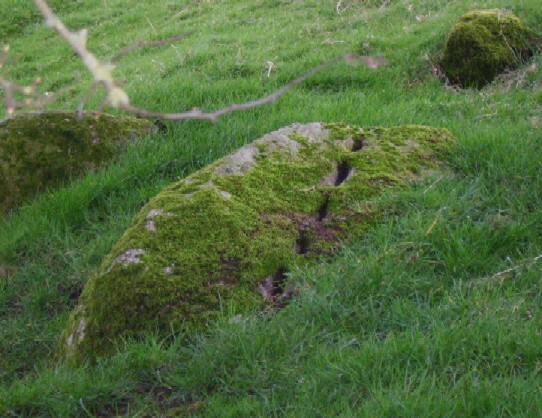 This relatively small but perfectly rounded passage mound is significant in that as well as being in view of the Boyne valley, it contains some of the best examples of engravings in all Ireland, including several similar to those found on the light-box lintels at Newgrange and Gavr'inis. Sadly, very little is left of this once covered over 'Portal tomb'. Weighing in at an estimated 150 tons, the granite capstone on this partially collapsed dolmen is said to be the largest megalith in Ireland. Ireland's R.S.C's. (Recumbent Stone Circles). The Ross-Carbery RSC's - The R.S.C's (Recumbent Stone Circles) found in the Ross-Corbery area of southern Ireland are unique both in the fact they are the only R.S.C's found off the UK mainland, and that they are solar in orientation rather than lunar, as is the case with the numerous Grampian R.S.C's in Scotland. There is a clear suggestion of contact between the two regions. Location - River Boyne, County Meath, Ireland. Description - The Boyne Valley complex is one of Europe's greatest megalithic sites. It was constructed at around 3,300 BC, the same time as several other prominent megalithic complexes. It is clear from the orientation of the passage-mounds that the whole complex was devoted to accurate measuring of both the lunar and solar cycles simultaneously. 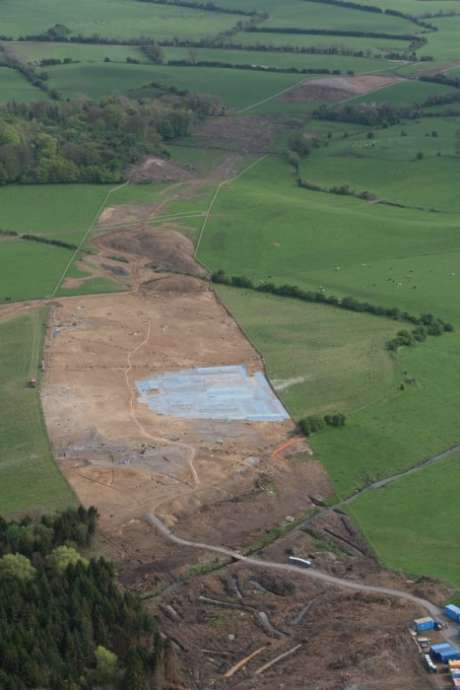 'It has been shown that the Boyne valley monuments were probably laid out to a design plan' (2). 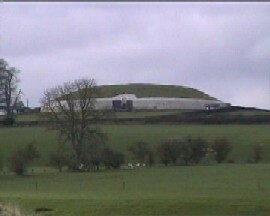 The three main features of the complex are the passage mounds named Newgrange, Knowth and Dowth. At present Newgrange is open throughout the year, Knowth is open for parts of the year only, and Dowth is closed the whole year round, but is free to roam around the outside. Astronomy - 'The map of the external design plan of the complex (see above) demonstrates a concern with solstices, equinoxes and cross-quarter days' (2). 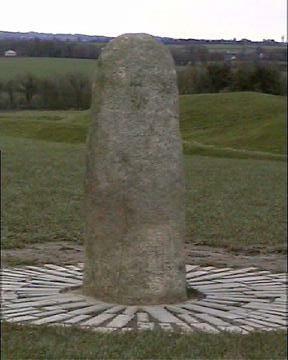 There are 97 kerbstones on Newgrange, and only three of them are fully carved, their astronomical positioning is 'highly significant', and it is the clear from the extra energy involved in creating accurate alignments and orientations that astronomy played a fundamental role in the structures existence. 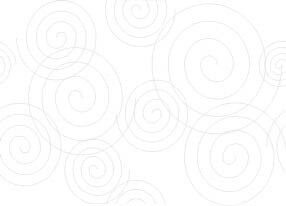 A Cursus 'of unknown length' (3), has been found just east of Newgrange. The cursus is barely visible today but extended around 100 m from the valley of the River Mattock to climb the ridge occupied by the Newgrange tomb. Here it is rounded off by a terminal bank. The cursus was around 20 m wide. It is similarly orientated to the mid-winter solstice, as is the passage mound itself. The Boyne-valley complex is intervisible with other prominent megalithic sites such as: Tara Hill, Loughcrew and Four-knocks. There are several noticeable similarities between the megalithic structures of Ireland and those from both France and Scotland. Contemporaneous construction features, carvings, and the specific orientation of passages makes it difficult to ignore the idea that they might have been built by the same extended cultural group. Both Gavr'inis in France and Maes-Howe on the Orkneys (and the Maltese Temples), were built at the same time as (dated at 3,300 - 3,100 BC) as the Boyne Valley complex..
Newgrange, Gavr'inis and Maes-Howe all had their passages aligned to the winter solstice. (Close to the Moons eastern major standstill). 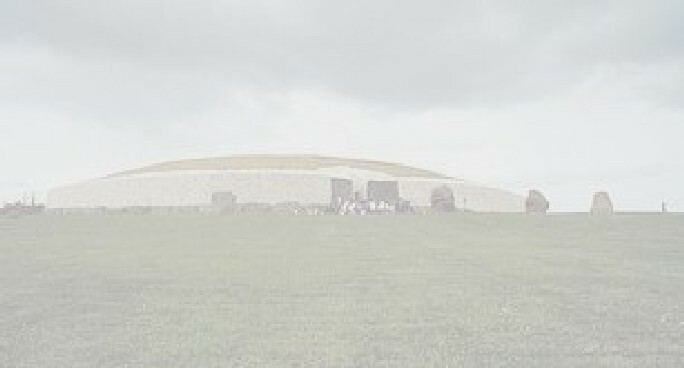 The interior floor-level of Gavr'inis and Newgrange were raised towards the centres. At Newgrange, the upwards-sloping passage narrows the beam of light into a thin strip. In fact, the only light that would have originally been able to enter the internal chambers would have come through the 'light-box', above the passage entrance. Light-boxes are a megalithic construction feature that have so far only been recorded at three (possibly four) sites in the UK, with two in Ireland (Newgrange and Carrowkeel - see below) both having the same design, and the other two on the Orkneys in Scotland. This particular connection is very specific. A further connection between the two cultures came from Hencken's excavations of 1935, when a chalk ball was discovered at Creevykeel, which is an item similar to those found in Brittany and on the Orkneys. The lintel stone over the light-box at Newgrange (see below), has a series of crosses engraved on it and there is a similar stone on the floor of the Gavr'inis passage mound, and others at Fourknocks in Ireland. The Irish Recumbent Stone Circles (RSC's) have been mentioned above. The only other place these particular constructions are found is in Scotland. Irish Light-Boxes: Form and Function. Ireland has (at least) two of the finest examples of light-boxes in Europe. Light-boxes are a megalithic construction feature that have so far only been recorded at three (possibly four) sites in the UK, with the two in Ireland (Newgrange and Carrowkeel - below) both having the same design, and the other two on the Orkneys in Scotland. Although they show a regional variation, the principle of the design is the same, and is invariably found associated with passage mounds. In addition, Bryn Celli Ddu in Wales also has a portal design which creates a 'light-effect' in the chamber on the summer solstice. 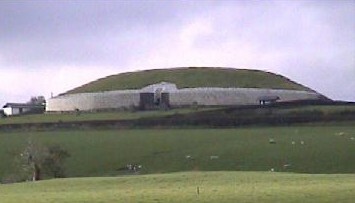 Newgrange (left), and Carrowkeel (right). 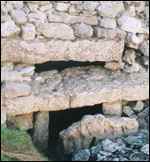 All the mentioned sites have been shown to have been deliberately constructed so as to allow the rays of the sun (and/or moon) into the interior of the passages for very specific time periods only. One of the stones from the light-box at Newgrange (below) has a particular design on it which can be found at two other passage mounds: Gavr'inis in France, and Four knocks in Ireland - (which is unusually oriented to 17° east of true-north), a feature which is also curiously present at several Pre-Columbian structures, and suggestive of a preference of orientation towards a star, or possibly magnetic north, rather than the more common orientation towards prominent phases of the cycles of the sun and moon. Only 8 crosses are visible today at Newgrange, but it is likely that there may once have been another, as a section of the front of the lintel appears to have been lost (a detail not visible following the reconstruction). If there was another cross, as the picture (right) suggests, then the total would be the same as the stone at Gavr'inis, which also has nine crosses on it. It is therefore no accident that this Henge is exactly where it is. Beltany Stone circle - Possibly originally a kerbed passage-mound. Boyne Valley. 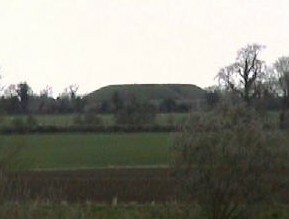 The Passage mound complex. Megalithic capital of Ireland. Browne's Hill. 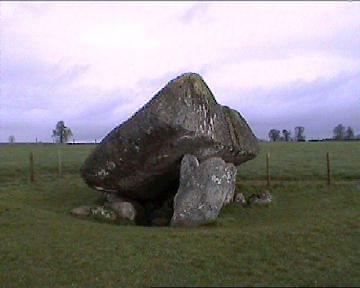 Dolmen with the largest capstone in Ireland. Carrowkeel. Passage mound complex. Light box features. Castleruddery. Henge-circle with huge quartz portal-stones. Creevykeel. One of over 350 'Court-cairn's' in Ireland. Dowth. Passage mound. Part of the Boyne valley complex. Drombeg. Recumbent stone circle. Solar orientation. Fourknocks. Passage mound. Highly engraved interior. Grange Circle. Largest Stone Circle in Ireland. Knocknarea. 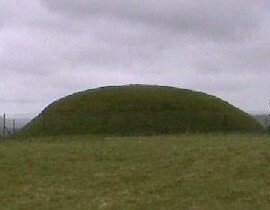 Sacred Hill with huge passage mound on top. Knowth. Passage mound. Part of the Boyne valley complex. Loughcrew. 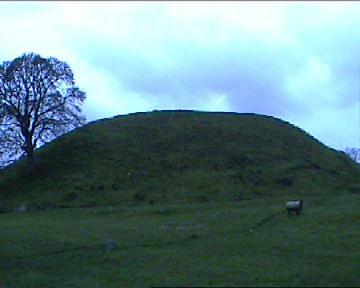 Complex of passage-mounds covering four adjoining hill tops. Newgrange The classic passage mound - Part of the Boyne Valley complex. Tara Hill. The 'Sacred heart' of Ireland. 2) J Patrick, 'Midwinter Sunrise at Newgrange', Nature, 249, 1974, pages 517-19.